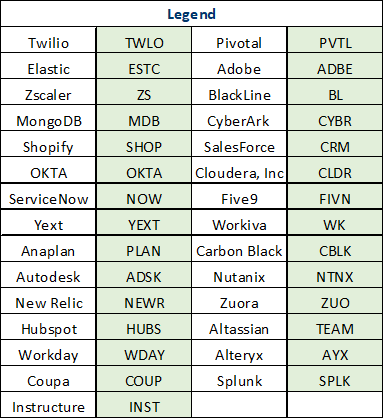 Overview of ‘best of breed’ enterprise SaaS companies. Overall valuations have climbed by ~5.6X revenue multiple turns since end 2016. 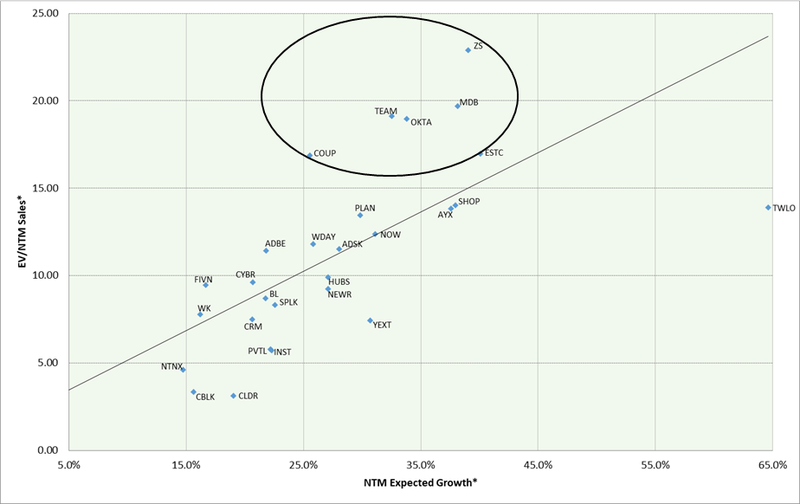 A number of companies appear overvalued on a relative basis. Enterprise software is software used by companies and organisations, as opposed to individual consumers. 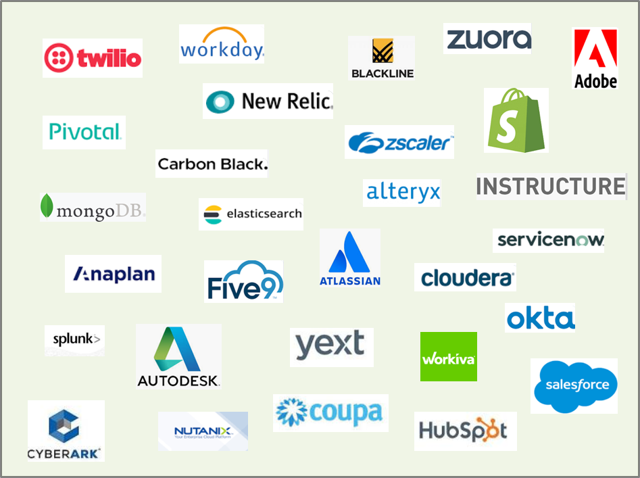 Enterprises are increasingly consuming software as a subscription service rather than through perpetual licenses. 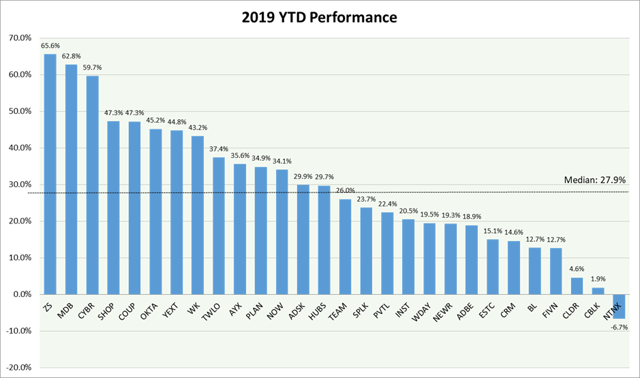 According to forecasts by Gartner, cloud software growth is expected to be 22% in 2019 as compared to expected overall IT growth spend in 2019 of 3.2%. 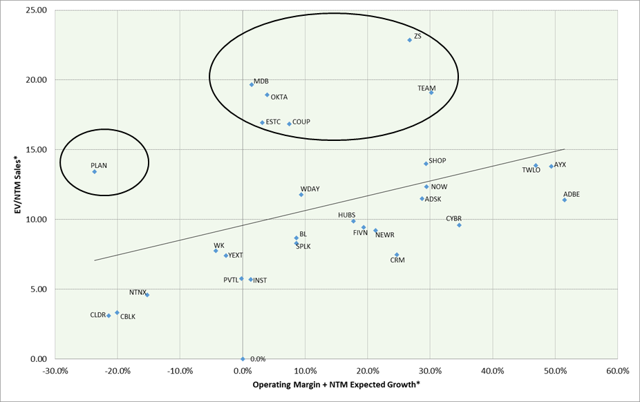 The growth in cloud software is driven in large party by digital transformations ongoing at enterprises, where initiatives include cloud adoption (with hybrid cloud increasingly popular), DevOps and a digital customer experience. Increasingly, best in class software incorporate artificial intelligence providing increased automation and analytics. Globally, we are still in the early stages of the enterprise SaaS story especially in regions outside of the USA and Europe. This article provides an overview of the ‘best of breed’ enterprise SaaS market, as represented by the following 29 companies (Enterprise SaaS Group). Since the start of 2016, the iShares Expanded Tech-Software Sector ETF (IGV) is up 106.36%, outpacing the 40.82% growth in the S&P 500. Year to date, the IGV is up 22.05% vs 14.81% for the S&P 500. The Enterprise SaaS Group has outperformed year to date with a median return of 27.9%, with a couple of names such as ZScaler (ZS), MongoDB (MDB) and Cyberark (CYBR) having returns of over 50%. 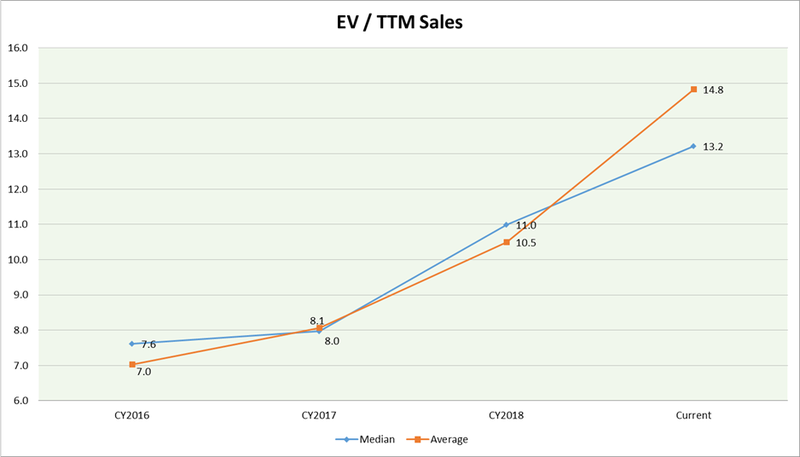 Overall valuations have climbed over the last 2 years, with the median Enterprise Value (NYSE:EV) / trailing twelve months (NYSE:TTM) multiple climbing from 7.6X at the end of 2016 to 13.2X currently. 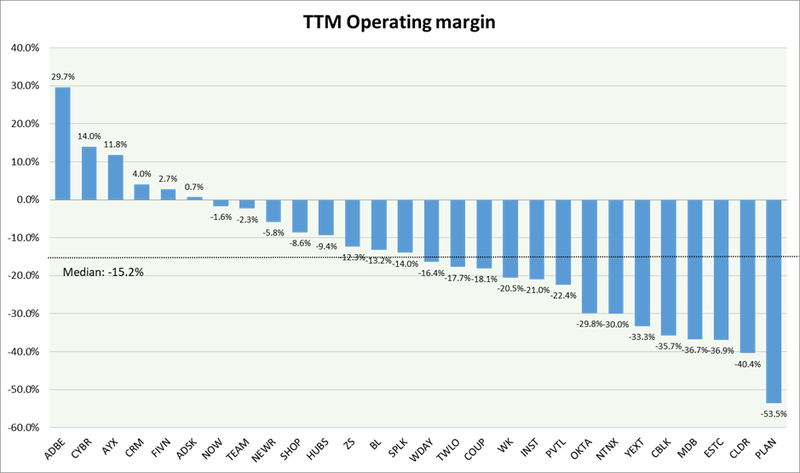 The average multiple has climbed even faster to 14.8X, pushed up by a number of names such as Twilio, Altassian (TEAM), MongoDB and OKTA (OKTA) which trade at a multiples over 20X. 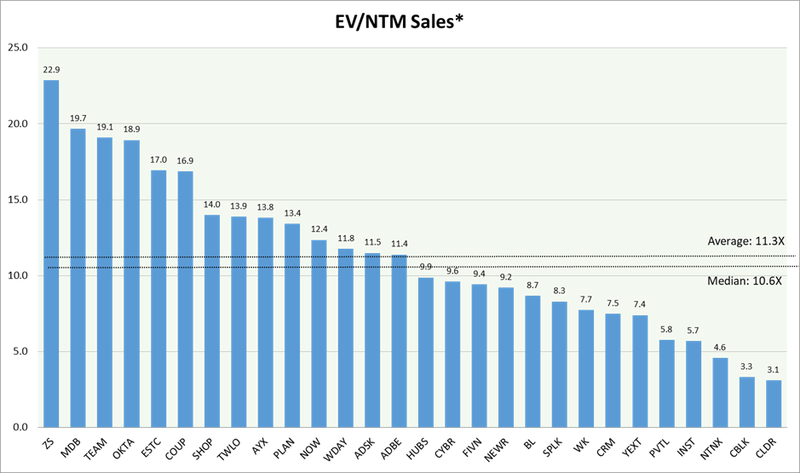 Looking out a year, the median EV / next 12 months (NTM) multiple is currently 10.6X. *Based on consensus estimates for FY ending Dec19 to Jan20; pro-rated between FY19 and FY20 estimates for Companies whose FY does not end on Dec/Jan. 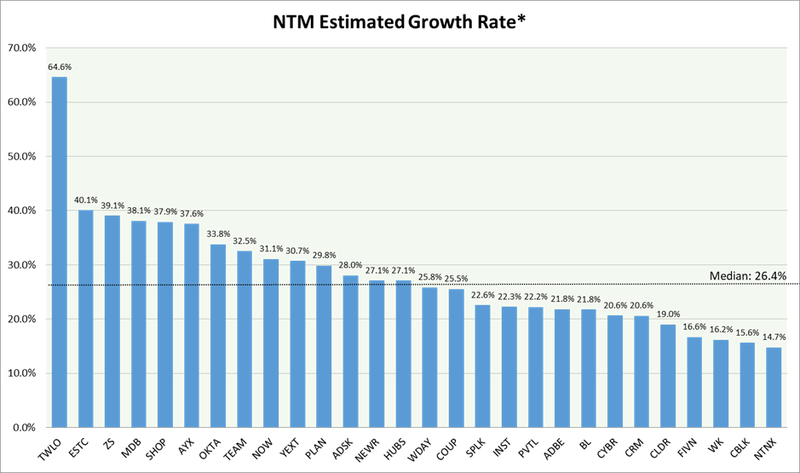 The median estimated NTM growth rate is 26.4% while the median TTM operating margin is negative 15.2%. To give a better idea of relative valuation, the charts below do a comparison between the EV/NTM multiple and the NTM estimated growth and NTM estimated growth plus operating margins. The names circled appear overvalued relative to the group. 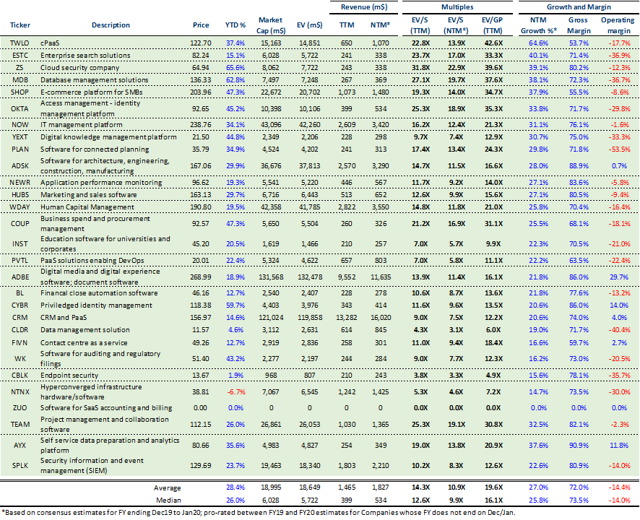 The table below gives an overview of the companies in the Enterprise SaaS Group and their current operating and valuation metrics. I hope this article has given readers a starting point for further research. Disclosure: I am/we are long CLDR, PVTL. I wrote this article myself, and it expresses my own opinions. I am not receiving compensation for it. I have no business relationship with any company whose stock is mentioned in this article.